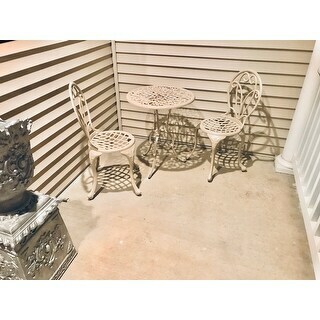 This set is super cute on my small front entryway and works so well with a cast aluminum planter I have. I did overlook that I was purchasing this in sand. I wanted white, but this color is beautiful and I won't be sending it back. I may paint it to match the planter. Can't wait for the weather to get warm enough for my fern. My picture is pretty plain because we just got it together and put into place. Assembly was easy but time consuming. This set seems well made and is even heavier than I was expecting for the price. It is a much better fit than the less fancy wood bench I had on the porch before. Brighten up your patio space with the beautiful Elegance 3-piece bistro dining set. Finished in a chic Beach Sand off-white color, the two scrollwork and lattice-designed chairs surround a three-legged round table with an ornate scrollwork top. Each piece of this dining set is built with durable cast aluminum frames for weather resistance and lasting charm. This beautiful set was easy to assemble. It arrived quickly, and was easy to assemble. The chairs are much more comfortable than they look. I orginally bought the set for myself, but it ended up on my daughter's balcony. I need to get another one..
"What is on the bottom of the legs to protect the deck?" The table and chairs have little rubber feet that screw into the bottom of the legs.